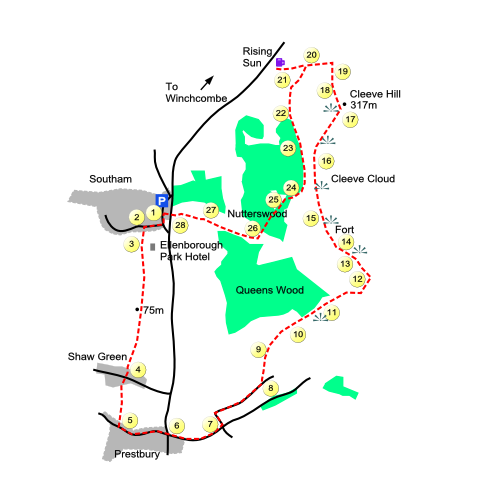 Cleeve Hill is one of the jewels in the Cotswold Edge Walks series. Thousands of years of history are etched in to the landscape and, from the highest point in the Cotswolds, you will be treated to a spectacular view stretching for over 70 miles towards the Welsh Black Mountains. Park along Old Road (or in the layby further up the hill on the main road to Winchcombe). From Old Road head down hill and take Southam Lane on the right. After a few hundred yards, look out for a farm gate on your left and go through it in to a field. Veer left and pass along the fence in front of the impressive Ellenborough Park Hotel. Views of the surrounding countryside already start to appear. Follow the footpath for about 1/2 mile, over a number of wooden bridges and passing through several gates along the way. When you reach a road cross over and continue until you reach St. Mary's church. Turn left, pass the Plough pub and follow the road as it veers left. When you reach a crossroad go straight on and continue along Mill Lane. After about 1/4 mile you will come to another crossroad. Take the road on your left here and follow the road for another 1/4 mile to some buildings on your left. Pass the houses and turn left going through the gate at the rear of Highcroft. You are now on the Gustav Holst Way and are about to start climbing. Onwards into the next field, continue to climb and head towards a large twisted Ash tree. After the Ash tree you will soon come to the edge of the field. Climb over the double fence here and carry on up the Gustav Holst Way. At the next style you could stop for a while to catch your breath. Here you will see an emerging view behind you. Continuing with your climb, you will shortly pass through a gate and veer to the right. The path eventually becomes a sunken track and at a crossroad of paths take the track on the left. Carry on in this direction following the Cotswold Way marker posts. Views to your left now come and go. After a while you will reach a gate which takes you on to Cleeve Hill common. Now, keeping a dry stone wall on your left, make your way gently uphill, still following the Cotswold Way marker posts. At a couple of benches near some trees there is a great view of Cheltenham race course way below. Go	straight on along the cliff edge for a short while, then turn right uphill towards a bench in the distance. At the bench go through a gap in the bank. You will now be passing through the earth works of what is thought to be an iron age fort. Keep following the marker posts. Eventually the marker posts veer away from the cliff top and point towards a corrugated mushroom shaped post at the top of the hill. As you climb, a truncated pyramid shaped trig point appears to the right of the mushroom and	reaching the top, the mushroom turns out to be a topograph. 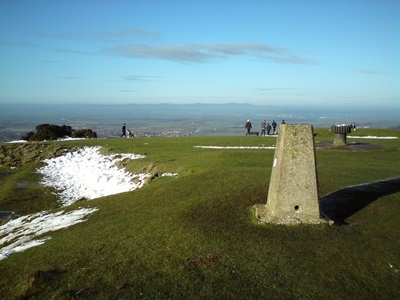 The topograph points to all the features you can see from the top of Cleeve Hill. Unless it is a bad day you will be able to see across the Severn valley to the Malvern Hills and if the weather is really clear you will be able to make out the Black Mountains 77 miles away. When you are ready to move on, head towards the Malverns and a bench overlooking the view. From here follow the Cotswold Way sign downhill. The village of Bishops Cleeve is clearly visible in the valley below. Turn right at the next marker post passing between gorse bush thickets and continue down hill to the next marker post. Now turn sharp left on the gently sloping path down hill, heading towards clump of trees and a small cutting where the path disappears down hill. The path becomes stony as it descends through the gap. You are now faced with the difficult decision whether to take a short detour to the Rising Sun or whether to continue on your journey. If your choice is the wisely made to visit the Rising Sun continue your descent, keeping the clump of trees on your left. Cross the cattle grid and the Rising Sun will be on your right. When you have finshed your refreshment return to way point 20. Looking downhill from way point 20, take the level path curving round to the left keeping the clump of trees on your right. You will now be passing through the uneven landscape left by ancient quarrying. As the path forks, take the upper path to your left and keep going until you reach a well made track. Cross the track and follow the path with a dry stone wall to your right. Cliff faces of the honey coloured limestone begin to appear on the left, sometimes dotted with sheep or climbing folk. Rejoin the track that you crossed earlier and carry on. Beech trees overhang the track here. Eventually the track swings left and then forks right towards some houses. As the path levels in front of the houses, seek a footpath to the right by a gate leading in to trees. Follow the path down hill. As you emerge from the trees, turn right and head downhill, eventually meeting another track. Continue downhill and when the track veers right take the footpath going straight on. Cross a style and follow the path under the bows of some old Willow trees to a gate by a house. Sunset Lane now takes you all the way to the bottom of the hill. Cross over the road and carry on down a flight of steps. You are now just a few steps away from your starting point and a well deserved rest.